The 72" wingspan version of the Air Tractor AT502 is well flight tested, and has been shipping for four years. Prototype "ONE" now has around 200 flights, and is still performing great! The AT502-72 has met the original design goal, and that was to be one of the most fun, and enjoyable week end planes that you will want to take to the field every time you go. 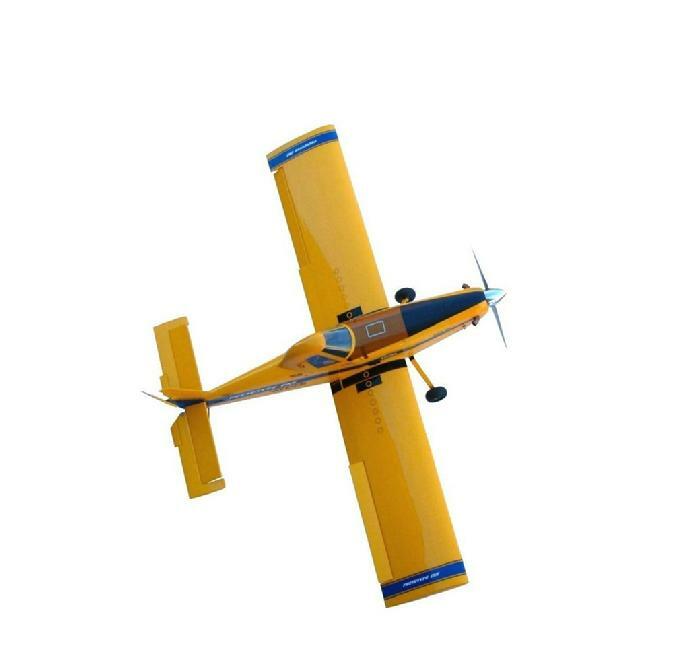 It is a great flyer, will perform most aerobatic maneuvers easily, while looking very much like the full scale Air Tractor 502B. Thanks to YOU, the Modelers who enjoy scale, scratch-build projects... the AT502-72 has been a very sucessful part of Teamduster Designs. Many of our customers have indicated that the building process is straight forward, fun, and rewarding at the finish... then there is the great feeling of having something at the field that is very scale looking, and not like all the other models. A special THANKS also to our partners who build, and supply the other components for the completion of the 72... TNT Landing Gear, GLhobbies, and National Balsa.... A special Thanks to Roger Marshall at Camden Cutters for producing excellent laser-cut short kits for both Airplanes. Since January 20th 2006 when the first short kit and plans were shipped the response has been more than we had hoped for. Many scratch-builders are totally satisfied with plans, laser-cut parts, and how the airplane is constructed. The 502-72 is an "almost" scale version of the AT502-100 which we have been shipping for about four years now.... wing span on the 502-72 is 72". From the profile view it is exactly 72% of the popular 100" Air Tractor. Prototype One weighs 10.5 pounds and flies great on a Saito 100 4-stroke. Great ideas for Engine options are coming in from all over the place... builders are mounting everything from OS 70 4-stroke to 120 4-strokes with pump, and even a few are planing to use the new Saito 125 for extreme vertical performance. As with the 100" the Construction Photo CD with around 450 photos of the building process, approx. 80 photos of the Full Scale, and a 17-page builder's manual is included with the Plans at no additional charge. The Short Kit is priced separately as we have done with the 100". We price the short kit separately because some scratch-builders who enjoy cutting out all the pieces from the plans do not need the laser-cut short kit. 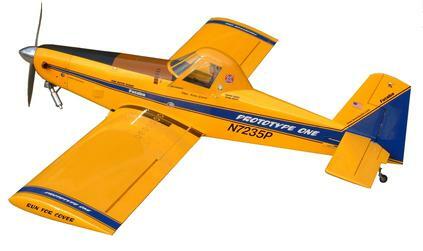 Cowlings and Canopies are available from G & L Hobbies in Cookeville, Tennessee. Landing gear and Wing Tube set are available from TNT Landing Gear in Swanton, Ohio. A completetion Wood package is available from National Balsa. Laser Cut Short kit includes: Firewall, Fuselage Formers, and doublers, Plywood sides at wing location (with holes for wingtube, wing bolt, dowel, and wires), Wing ribs, Aileron ribs, shaped fin pieces, shaped rudder pieces, landing gear block (with doubler), and bottom servo hatch frame with door. Shipping, and Handling runs around $25.00 for most areas of the USA. We will have to compute cost for shipping outside the USA. Just send us an email from the site if you are interested in the 72. Payment should be a Money Order or Bank Check made to: Hollis Calvert, 1890 Zion Road, Collinsville, ms 39325. Looking forward to hearing from you... if you have questions please call or email. Click on the thumbnails below, and see a sample of what is contained in the Photo Construction CD. There are approx. 460 building photos on the CD along with approx. 70 of the full scale Air Tractor AT502B. Check out the videos below... They are short segments of the flight and were recorded at the Meridian Aeromodelers field, Meridian, MS. John Freeman did the camera work, and got the Teamduster AT502-72 performing a blender / inverted flat spin in the first video.